CANE TOAD RESEARCH GETS A BOOST! Dead cane toads – normal and abnormal, for education and scientific purposes - can now be brought back to Kununurra after the recent grant by Ag WA of a licence to Lee Scott-Virtue, the field coordinator for and president of the Kimberley Toad Busters, based in Kununurra. The Kimberley Toad Busters - who now comprise over 30% of the Kununurra community - have been toadbusting every weekend for over 19 months, therein eradicating 101,001 cane toad adults to date from the colonising fronts spread across 120,000 sq kilometres. Lee says, “Our work is in the Northern Territory , 100s kms from Kununurra. WA quarantine regulations prohibit bringing dead cane toads back to WA, even for educative purposes, without a licence. Of even greater importance, is that when we found abnormal toads that might be of interest to scientists studying Cane Toads, all we could do was photograph them and distribute the photos by email to the scientists”. 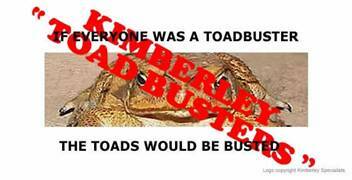 Now the KTBS through Lee are authorised to bring the toads back to Kununurra, AS LONG AS THEY ARE DEAD. “We would not want to bring them in any other way!” said Lee. The KTBs are most grateful to the Minister for Agriculture, the Honourable Kim Chance for his support for this approach from the KTBs, and to his Department for issuing the licence. However, the KTBs still have had no funding from the WA State government for their volunteer field campaign.